Mightily bearing the almighty Word. 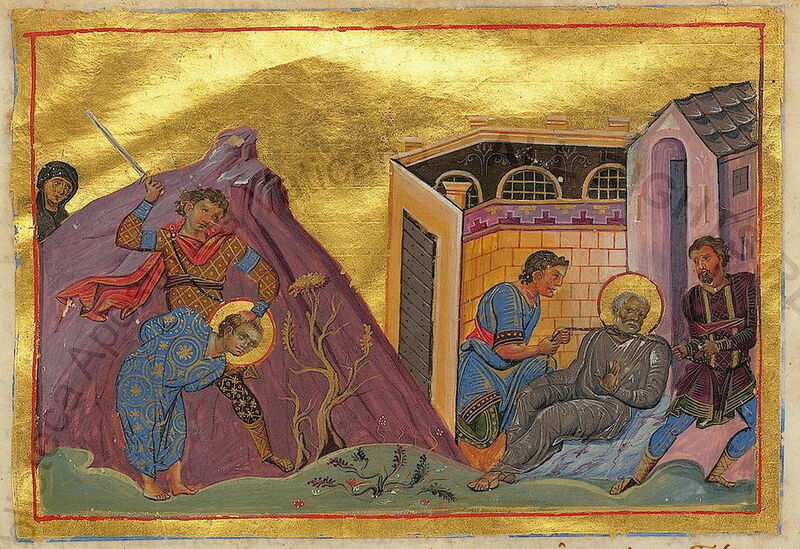 Romanos suffered martyrdom in the city of Antioch. But this Romanos belonged to Palestine, and he was a Deacon, and an Exorcist likewise, in one of the villages of Caesarea. And he, too, was stretched out upon the rack, and like as the martyr Alphaeus had done in Caesarea, so did the blessed Romanos by his words of denunciation restrain from sacrificing those who, from their timidity, were relapsed into the sin of the error of devils, recalling to the minds of them all the terrors of God. He had also the courage to go in together with the multitude who were dragged by force into error and to present himself there in Antioch before the judge. And when he heard the judge commanding them to sacrifice, and they, in trepidation from their fears, were driven with trembling to offer sacrifice, this zealous man was no longer able to endure this sad spectacle, but was moved with pity towards them as towards those who were feeling about in thick darkness, and on the point of falling over a precipice, and so he made the doctrine of the religion of God to rise up before them like the sun, crying aloud and saying: "Where are you being carried, oh men? Are you all stooping down to cast yourselves into the abyss? Lift up the eyes of your understanding on high, and above all the worlds you shall recognize God and the Savior of all the ends of the world; and do not abandon for error the commandment which has been committed to you. Then shall the godless error of the worship of devils be apparent to you. Remember also the righteous judgment of God supreme." And when he had spoken these things to them with a loud voice, and stood there without fear and without dread, at the command of him who was constituted judge there, the officers seized him, and he condemned him to be destroyed by fire, for the crafty judge perceived that many were confirmed by the words which the martyr spake, and that he turned many back from error. And because the servant of Jesus had done these things in the place where the emperors were, they at once brought out this blessed man into the midst of the city of Antioch. And he was brought to the spot where he was to undergo his punishment, and the things which were required for the fire were made ready, and they were busying themselves to fulfill the command with haste, when the emperor Diocletian, having heard of what was done, gave orders that they should withdraw the martyr from the death by fire, because, said he, his insolence and folly were not suitable for punishment by fire; and so, like a merciful emperor, he gave order for a new kind of punishment for the martyr, that his tongue should be cut out. Nevertheless, when that member by which he spoke was taken away, still was his true love not severed from his God; neither was his intellectual tongue restrained from preaching, and immediately he received from God, the sovereign of all, a recompense for his struggle in the conflict, and was filled with power much greater than he had before. Then did great wonder seize upon all men; for he, whose tongue had been cut out, forthwith, by the gift of God spake out valiantly, and heartily exulted in the faith, as though he were standing by the side of Him in whom he made his confession; and with a countenance bright and cheerful he saluted his acquaintance, and scattered the seed of the word of God into the ears of all men, exhorting them all to worship God alone, and lifting up his prayers and thanksgiving to God, who works marvels. And when he had done these things he mightily gave testimony to the word of Christ before all men, and indeed showed forth the power of Him in whom he made his confession. And when he had done so for a long time he was again stretched upon the rack; and by the command of the governor and the judge they threw upon him the strangling instrument, and he was strangled. And on the same day as those blessed martyrs who appertained to Zacchaeus he was consummated in his confession. And although this man actually passed through the conflict, and suffered martyrdom in Antioch, nevertheless, because his family was of Palestine, he is properly described among the company of martyrs in this our country. The summary above of the martyrdom of Saint Romanos given by Eusebius is actually only part of the story, which was expounded upon in a Syriac text, as well as in two homilies by John Chrysostom and a poem by Prudentius. In certain synaxaria, such as that of Constantinople, there are two martyrs by the name of Romanos commemorated on November 18th, that in fact compliment each other well, surely making them the same Martyr. One difference is the mention of an often nameless child, though some sources give the child's name as Barulas. Below is the reading from the Synaxarion of Constantinople for Saints Romanos and the Child Martyr. And was steadfast in his joy at being strangled. And is seen sitting in council with the children of Bethelehem. Romanos lived during the reign of Maximian (286-305). With the zeal he had on behalf of his faith in Christ, when Asclypiades the eparch entered the temple of the idols, the Saint went and caught up to him, saying: "The idols are not gods." For this he was punched in the mouth and then hung up and lacerated. The Saint then asked for a young child to be brought, who further rebuked the eparch. The eparch then asked the child: "In which God do you believe in?" He responded: "In the God of the Christians." For this the child was beaten, with his mother standing at his side. After the beating he became thirsty, so he asked for water, but his mother, being pious and a lover of God, said: "Do not drink, my child. Do not drink from the perishable and temporary water, but be patient, so that you will drink from that living and immortal water of blessedness." When the child rebuked the tyrant, he was beaten for a second time. Then he was beheaded by a sword, and the blessed one received the crown of the contest. 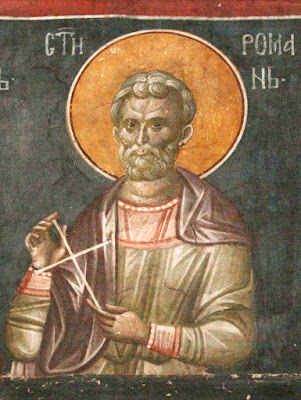 As for Romanos they cut out his tongue, and after it was cut out, in an astonishing manner he was able to speak again, thanking God. When Emperor Maximian heard of this astonishing miracle, he ordered for the Martyr to be strangled to death in prison, and he was delivered from this temporary life. Thus the Saint received the unfading crown of martyrdom. And Romanos beheld Barulas, sad and tear-stained. Barulas had a heart purer than a lily. Is Christ better, or our gods?" "Christ is far better than your idols!" "Had I known, O Child, I would not have asked you! How is Christ better? Come, tell me." Idols are fancies of the demon's kingdom." The governor, now furious, beat the child. Christ alone is God; He enlightens men." "Become worthy, O Son, of the rank of martyrdom." And glorified Christ, himself and his mother. The renowned pair of prizewinners glorified the Trinity. They both fought valiantly and destroyed the enemy. Glorious Plato and godly Romanos, pray for us to the Lover of mankind. O all-lauded Romanos, since the Church hath thee as a bright, majestic star, she is now guided by the light of thy great contests, and she doth praise and glorify thine all-luminous memory.